You’ve had a few restless nights in a row now and they are starting to take their toll. You toss and turn willing yourself to sleep with no luck. You get up to get yourself a drink about five times a night. You end up checking emails and Instagram just to pass the time. You know you aren’t getting enough sleep but you also know what the reason for this is – stress. Here are four ways to get to sleep when stress is keeping you up at night. Trust us they really do work. According to sleep therapists, tactical breathing is the best way to reduce tension and stress. It also works in under 30 seconds, which is just the quick fix you need when you’re desperate to get back to sleep. Take a long, slow breath in through your nose for 4 seconds. Hold for a count of 4. Then blow out through your mouth for another count of 4 and hold your breath for another 4 seconds. Repeat this again and you’ll start to feel much calmer. The reason why this works is because it balances the oxygen and carbon dioxide mix in your blood. Give it a try. Have a bath, get into some fresh pyjamas and make your bed. Doing these steps can really help you feel prepared for bedtime. Creased sheets or nightwear can also activate skin sensors just enough to keep you awake. Another good alternative is silk bedding, such as silk pillows from Gingerlily. These have a luxurious feel that will make you feel comforted and therefore more sleepy. If your mind is constantly spinning, and you can’t sleep from all the ideas and thoughts flying around in your brain, then this is a good one for you to try. Get a pen and notepad and write down everything you are thinking about. Write a to-do list for yourself, or just jot down your stream of thoughts. This will clear your mind as you won’t be worrying about forgetting your thoughts. You can come back to it all in the morning. A tidy room does actually equal a tidy mind. Even if it’s too dark to see the mess anyway, just knowing that your room is organised will make you feel calmer and more prepared to sleep. Buy yourself a luxurious candle or some aromatherapy oils. They can do wonders to relax you. Your brain will also grow to associate the scents with bedtime, which will help you get into more of a routine. 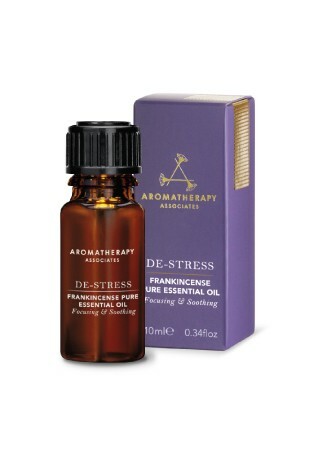 This De-Stress Frankincense Pure Essential Oil from Aromatherapy Associates is our favourite.